ASIA ACCURATE IN IMPERIA REGNA STATUS & POPULOS DIVISA AD USUM LUDOVICI XV GALLIARUM REGIS. 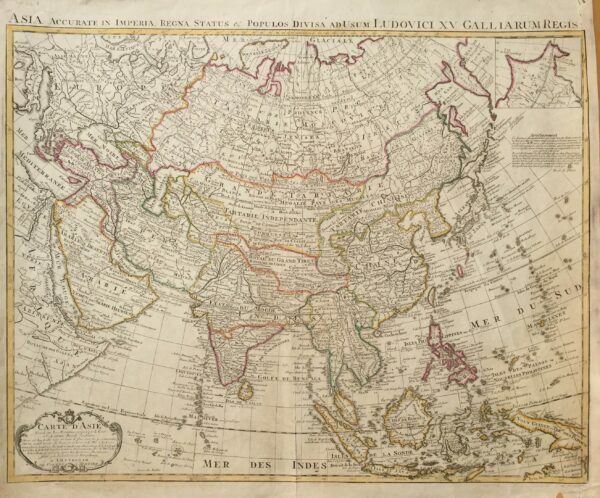 Early to mid-18th century map of Asia in outline colour by Guillaume De L’Isle (1675-1726), one of the most respected mapmakers of 18th century France. A pupil of Jean Dominique Cassini the supervisor of the triangulation survey of France, and a member of the French Académie Royale des Sciences, Delisle was recognized as ‘the first scientific cartographer’ for his rigorous application of the scientific method to map making and critical approach to the maps of his predecessors. The map was originally published by Delisle in the Atlas Geographie in Paris in 1700 with re-issues in 1705, 1708 and 1718 and after Delisle’s death in 1726, was issued between 1730 and 1774 as the Atlas Nouveau by the prolific Amsterdam publishers, Covens & Mortier; this map is from one of these editions. Covens & Mortier (fl. 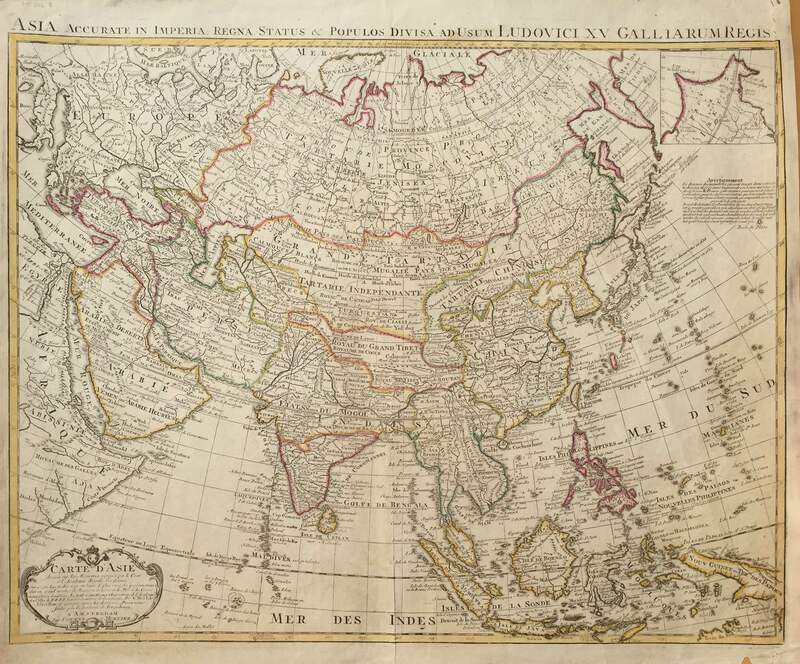 1721-1774) published re-issues of general atlases by by Sanson, Jaillot, Visscher, Delisle and De Wit. The map was originally entitled L’Asie and was re-named Carte D’Asie by Delisle in 1723 and first published by Covens & Mortier in 1730. The corrections to the various editions were generally in north-east Asia in Korea, Japan, the Kamchatka Peninsula and the Alaskan coastline, reflecting the surveys of Vitus Bering between 1725 and 1749, and the work of Delisle’s half-brother, Joseph, in the service of the Tzar of Russia in St. Petersburg. This source is referred to in the cartouche. Guillaume Delisle’s Atlas Nouveau 1730 by by Sanson, Jaillot, Visscher, Delisle and De Wit. Overall condition good apart from some light staining and browning of the paper in the lower left-hand quadrant of the map, a small loss of paper in the lower right-hand corner and some reinforcing of the right-hand margin; measures 482 x 482 mm.